The Canons’ Cloister refurbishment project was awarded ‘Highly Commended’ in the conservation category of the Royal Institute of Chartered Surveyors’ 2013 National Awards on Friday. Of the 11 Regional Winners in the conservation category earlier this year, only the Canons’ Cloister Project and the winner received recognition at the National Awards. The winner was The Florence Institute in Liverpool which, as the oldest purpose-built boys club in Britain was not only a building conservation project, but also an urban regeneration scheme. “The refurbishment provided a remarkable opportunity for rediscovering further evidence of the original floor plan and structure. 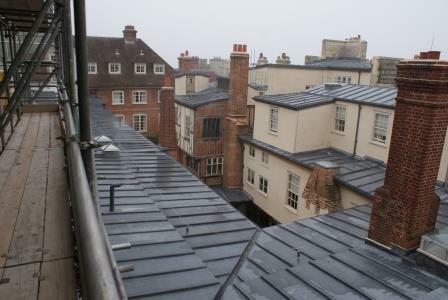 This combined with the refurbishment, which included replacing the original copper with a new lead roof, replacing cementitious render with traditional lime render, masonry cleaning and repairs, and structural repairs, made the conservation of the Canons’ Cloister a project of national significance”. More information about the Canons’ Cloister project can be found if you click here. The Deanery external refurbishment is just beginning with many of the same team members who worked on the Canons’ Cloister. For more information about the Deanery project please click here.